The photo below captures everything that Americans wanted to believe about the Iraq war in the earliest days of the invasion in 2003. Pfc. 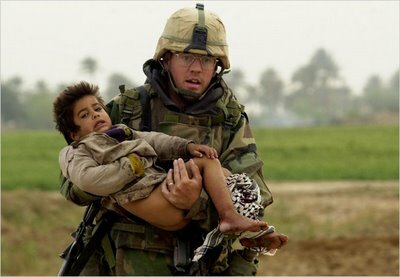 Joseph Dwyer, an Army medic whose unit was fighting its way up the Euphrates to Baghdad, cradles a wounded boy. The child is half-naked and helpless, but trusting. Private Dwyer’s face is strained but calm. If there are better images of the strength and selflessness of the American soldier, I can’t think of any. It is easy to understand why newspapers and magazines around the country ran the photo big, making Private Dwyer an instant hero, back when the war was a triumphal tale of Iraqi liberation. That story turned bitter years ago, of course. And the mountain of sorrows keeps growing: Mr. Dwyer died last month in North Carolina. He was 31 and very sick. For years he had been in and out of treatment for post-traumatic stress disorder and addiction. He was seized by fearful delusions and fits of violence and rage. His wife left him to save herself and their young daughter. When the police were called to Mr. Dwyer’s apartment on June 28, he was alone. They broke down the door and found him dying among pill bottles and cans of cleaning solvent that friends said he sniffed to deaden his pain. He had been heading for a disastrous end ever since he came home. Two of his best friends were Angela Minor and Dionne Knapp, fellow medics at Fort Bliss, near El Paso, Tex. For a while, they were part of a small, inseparable group that worked together, ate out, went to movies and called one another by their first names, which is not the military habit. Joseph was a rock, Ms. Minor said, a guy who would change your oil and check your tires unasked and pick you up by your broken-down car at 3 a.m. Ms. Knapp said he was like an uncle to her son, Justin, who was having trouble in kindergarten and brightened whenever Mr. Dwyer went there to check on him. Ms. Knapp was called up to Iraq, but Mr. Dwyer insisted on taking her place, because she was a single mom. He had no children at the time, and besides, he had enlisted right after 9/11 just for this. He went and stunned everybody by getting his picture all over the newspapers and TV. A few months later, he was home. He was shy about his celebrity. He was also skinny and haunted. Ms. Minor said he was afraid. Ms. Knapp said paranoid was more like it. It didn’t help that El Paso looked a lot like Iraq. Once he totaled his car. He said had seen a box in the road and thought it was a bomb. He couldn’t go to the movies anymore: too many people. In restaurants, he sat with his back to the wall. He said that Iraqis were coming to get him. He would call Angela and Dionne at all hours, to talk vaguely about the ‘demons’ that followed him all day and in his dreams. He became a Baptist, doggedly searching Scripture on his lunch hour for solace. His friends knew he was also getting high with spray cans bought at computer stores. His friends tried an intervention, showing up at his door in October 2005 and demanding his guns and cans of solvent. He refused to give them up. It’s not clear what therapy and medication could have saved Mr. Dwyer. He admitted lying on a post-deployment questionnaire about what he had seen and suffered because he just wanted to get back to his family. Ms. Minor said he sometimes skipped therapy appointments in El Paso. One thing that did seem to help, Ms. Knapp and Ms. Minor said, was peer counseling from a fellow veteran, a man who had been ambushed in Iraq and knew about fear and death. But that was too little, too late, and both women say they are frustrated with the military for letting Mr. Dwyer slip away. Private Dwyer, who survived rocket-propelled grenades and shocking violence, made his way back to his family and friends. But part of him was also stuck forever on a road in Iraq, helpless and terrified, with nobody to carry him to safety. Despite this sad tale, there is hope and solace, thanks to some wonderful spiritual counceling and outreach in Iraq by a Sergeant First Class in the US Army presently stationed in Iraq, Partha-sarathi dasa. Click here to read more.